Elf on the Shelf: miracle for parents or tiny oppressor? Is the Elf on the Shelf a miracle for parents or preparation for living in a surveillance state? As a child, I knew Santa was keeping an eye on me. Not because of that vague “naughty or nice” nonsense, but because my parents had a direct line to the jolly man from the north. A hotline, in fact. When my siblings and I misbehaved, my mother would pick up the phone and start to dial 1-800-YO-SANTA as she warned us that Santa was about to get an earful. She’d inform him that I was picking on my younger brother, or that he had been caught removing the screen in his bedroom window and attempting to climb onto the roof (again). She was such a tattle-tale. But it worked—we stopped fooling around. I’ve long suspected that my father came up with the 1-800-YO-SANTA idea while under the influence of some yuletide spirits. But now it seems my parents should have purchased the phone number and charged $2.99 for the first five minutes (plus 99 cents for each additional minute), because there is clearly a market for supplementing Santa’s surveillance. Hence the explosive popularity of The Elf on the Shelf: A Christmas Tradition. The Elf on the Shelf comes with a short picture book and a small, stiff doll. Parents read to their young kids the book, which tells the story of an elf who keeps an eye on a family during the day, then flies back to the North Pole at night to give Santa a sitrep. The tale helps build the holiday frenzy (and excitement for presents). Then, the parents put the elf somewhere in the house to watch over the children, their good deeds and bad. After the kids go to bed, when the elf is supposedly making its long commute back to the North Pole, the parents must move the doll to a new spot—a bookcase, the mantel, or some other cozy nook. Come morning, the kids try to find where the elf has situated itself for the new day. During sibling fights, moments of petulance, and other interludes of misbehavior, parents can point to the elf—whom the children have named—and say, “Do you want Santa to hear about this?” The elf-as-Big Brother effect, I hear, is a bit of Christmas magic for stressed-out moms and dads. That magic has translated into big-time sales. Since it was first self-published in 2005 by the mother-and-daughter team Carol Aebersold and Chanda Bell, the book has sold more than 2 million copies. (The mother used to warn her kids in the ’70s of an elf who would report back to Santa—see, Mom, you really should have made 1-800-YO-SANTA into a small business!) The company’s revenue in 2010 reached nearly $10 million. Earlier this holiday season, a 30-minute version of the story aired on CBS. As with the American Girl dolls, parents can choose an elf that looks something like their family, though the options are a bit limited right now: dark-skinned boy with brown eyes; light-skinned, blue-eyed girl; blue-eyed boy. “The Elf on the Shelf” is just another nannycam in a nanny state obsessed with penal codes. As long as you believe in him, the pixie-scout elf is no different than the store security camera and the gizmo that automatically generates speeding tickets. The tattle-tale elf, who reports back to the corporate Christmas machine, fits right in with our times. I have to imagine that many of the millions who have purchased the book belong to or at least sympathize with the ACLU, support the protesters battling the authoritarian Syrian regime, and bristle about Facebook privacy. So where does this cognitive dissonance leave us? Is it shortsighted to encourage children to behave as if they are constantly watched? Perhaps the briefness of the elf’s presence—most parents bring it out sometime after Thanksgiving—keeps it from conditioning children to tolerate, even expect, constant surveillance. But I’ve also heard parents say wistfully that they would like to have an elf as backup year-round. If I had children, I’m sure I would appreciate having the support of a magical creature who could dole out rewards. (Didn’t we used to call that “God”?) But removed from the necessity of maintaining household order, I find myself uncomfortable with the idea. But that is probably ridiculous: I tweet. I’m on Facebook (and am not terribly picky about whose friend requests I accept). 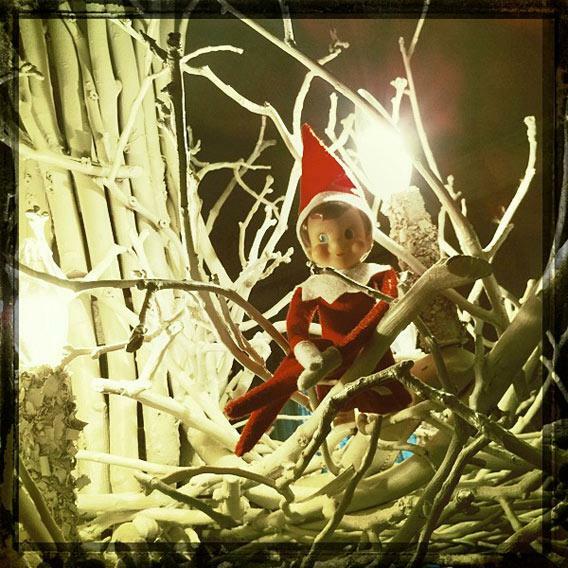 How is the elf’s (fake) watchful eye all that different from my new-mom friends who documented their pregnancies in extraordinary detail and now post pictures of their babies on a weekly basis? I’m already monitoring the behavior of infants I’ve never met. I see you when you’re naughty, and by naughty, I mean not sleeping through the night or suffering from really explosive diarrhea, which your mommies shared with me and the rest of their acquaintances. Perhaps the real pitfall of the Elf on the Shelf phenomenon is that parents can’t rely on it to keep order for very long. Another Slate colleague tells me that she is particularly concerned that her twin boys will soon deduce from the stacks upon stacks of Elf on the Shelf merchandise at local stores that their elfin monitor is not unique to them. Learning there is no Santa can be traumatizing for kids. But losing the Elf on the Shelf might be devastating to their parents.